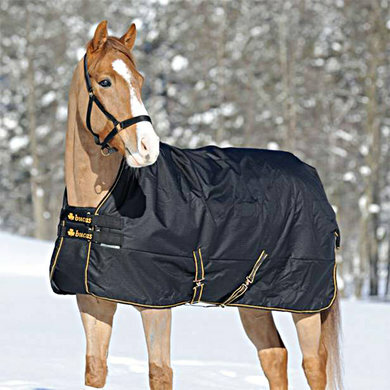 The Bucas Irish Turnout High Neck Black / Gold is an ideal outdoor rain blanket for the colder wet days. This blanket has a 300 gram thermo polyester filling. Because of this filling the horse stays at a comfortable temperature at an outside temperature between -10 ° to + 8 °. 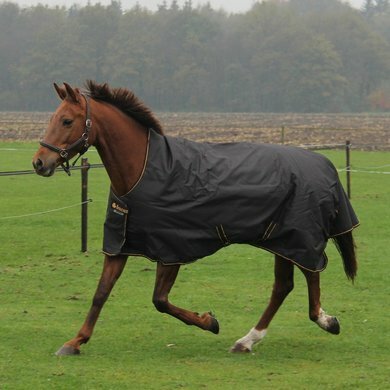 The blanket has a very strong outer fabric of 1200D rip-stop for a longer life. The inner lining is made of smooth nylon to minimize the chance of abrasions. Bucas Irish Turnout Light High Neck has an All-Fit design, which means that pleats are sewn at the shoulders. These pleats provide extra space and a perfect fit. This blanket is made without a deed and with an extra high neck. 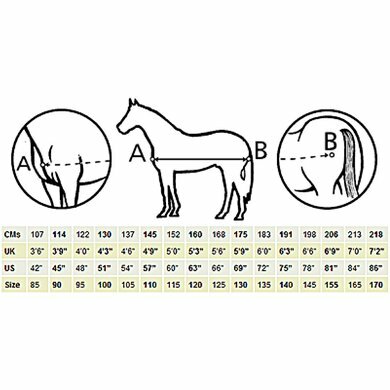 This high neck offers your horse extra comfort and does not rub at the withers. The blanket has 2 adjustable cross surcingles and has attachment points for belts. 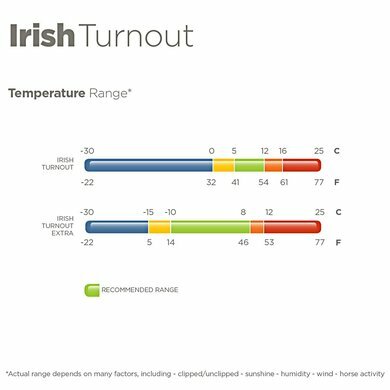 The Bucas Irish Turnout Light High Neck has a special chest closure. Bucas calls this the Overlap Front Pad, this is a comfortable cushion that is incorporated in the blanket. 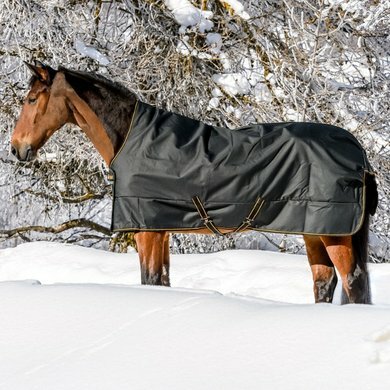 This cushion protects the horse against the chest closures of the blanket and offers extra comfort. This Bucas blanket has connections to attach a underblanket. This makes an effective sweat and stable rug in an instant of your rain blanket! - Outer fabric: 1200D rip-stop polyester. - Filling: 300 gr thermo polyester. - Inside lining: Smooth nylon. - Breast closure: Ankle / straight. - Other closures: Cross surcingles, leg strap, connection for diaphragm belts (not included), connections for underblanket. Good price / quality. Bucas is a good brand anyway.